Can we be secure if our climate is not? Picture this: an unidentified truck driver ploughs into pedestrians, killing and injuring scores of people. The next few hours are filled with news reports about the manhunt and suspected identity of the perpetrator. Finally, in a tense standoff between police, he is taken out. Sound familiar? This news sequence has, unfortunately, become commonplace, whether the assailant is a gunman, knife man, bomber, or driver. Afterwards, nationalist groups come out in favour of tougher borders to keep any and all foreigners, out of their country, including refugees. The term ‘national security’ is on the lips of every politician. It is an issue extremely important to the citizens of virtually every country. Yet, the idea of ‘national security’ and what poses real threats varies depending on the region. Earlier this year, the Pew Research Center conducted a study of 42,000 people in 38 countries to get a better idea of how people prioritise the greatest threats to their nation’s security. The poll’s options were: ISIS, cyber attacks, climate change, US power and influence, China’s power and influence, the condition of the global economy, and large numbers of refugees leaving countries like Iraq and Syria. Answers varied largely based on country and region, though it is clear that most, if not all, of these issues, are related. People regularly express concerns that refugees from war-torn countries may be supporters of ISIS. The Chinese and US economies do billions of dollars worth of business with one another, all the while fostering tensions, which affect other nations’ economies. Climate change has the ability to exacerbate all conflicts because it can easily hinder access to resources. 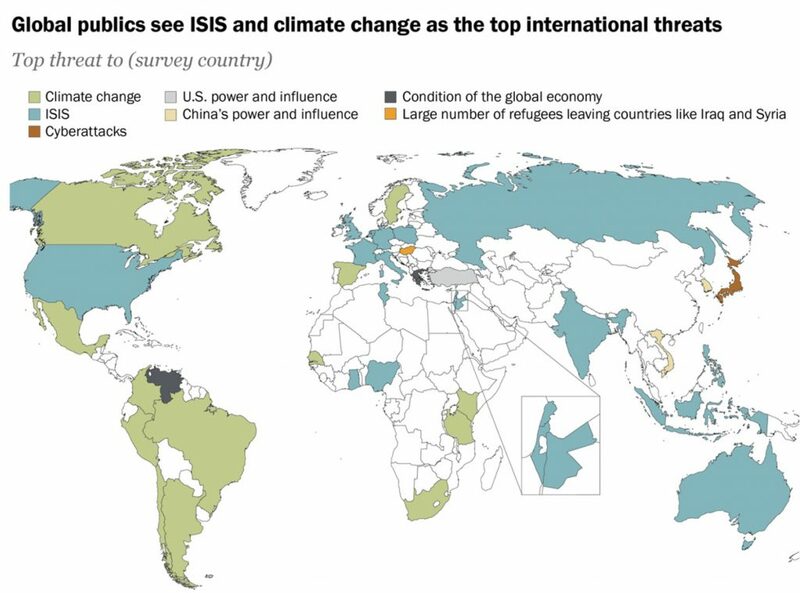 Climate change and ISIS were the top priorities for most nations polled. Climate change is a unique national security threat, because it is difficult to associate extreme weather events caused by climate change to the actions of one bordered nation, and the fallout of a crisis depends on what citizens were struggling with beforehand. It is a threat that manifests itself in a variety of ways, with often worse consequences for smaller, poorer nations. Many national security experts consider climate change a ‘threat multiplier,’ as it affects people’s access to basic resources, and the insecurity that brings causes economic and political instability. Droughts incite desperation in farmers whose crops yield far less than in previous years, and the subsequent spikes in food prices create distress among the populace. If governments are corrupt or inept at dealing with the problems, the situation escalates and may trigger a civil war, martial law, starvation, and even ideal conditions for radical groups with ulterior agendas. In an op-ed published in the New York Times in early June, Rice calls President Donald Trump’s withdrawal from the Paris Climate Agreement a, “coup de grâce for America’s postwar global leadership for the foreseeable future.” That decision fostered distrust among other nations who once relied on the US as a stabilizing force who took responsibility and a leadership role during times of crisis for allies and weaker countries abroad. Currently, whenever a natural disaster plagues another nation, the world comes to its aid to help victims get back on their feet – rebuilding infrastructure and providing basics like food, water, and temporary shelter. Yet, if disasters become more and more frequent, aid agencies and governments may not have the will or financial ability to continuously assist in the efforts. Also, some disasters may make small island nations uninhabitable, creating thousands of refugees seeking permanent residence in countries that will accept them and help them to integrate. Yet, some in these societies may feel disinclined to help if their own economies are struggling, leading to even more conflict, distrust, and resentment towards refugees and governments. National security is a general term that has become so overused and all encompassing that it can be used as an excuse for any manner of preemptive action by a government. Threats affecting the globalised world are mounting, in the form of economic instability, terrorism, and fair resource distribution; and, though most leaders are seeking rational solutions, some threats may never completely be contained. Admitting this hard truth, however honest, could be political suicide, and pushes desperate voters towards more volatile leaders. The push to grow the global economy now bumps up against nationalistic rhetoric in the face of threats that come to fruition. Climate change has no borders and is already disproportionately affecting the poor. The poor are usually less educated and become prime targets for extremists, who recruit for their sinister causes by citing the nationalistic policies of some countries seeking to keep out innocent victims of war and natural disaster. If we are to mitigate the effects of climate change on all fronts and bolster national security, we must invest in cleaner energy technologies, incentivise a decrease in per capita and corporate energy consumption, and put value on each and every human life by accepting those in desperate situations and integrating them into our societies – not only for the sake of our humanitarian duties, but to prevent the worst of conflicts on the home front.